"Looking For An Elegant, Stylish & Decorative Way To Seal Your Wine Or Champagne Bottles? Want To Save Money Keeping Your Wine For Later...Without Settling For Cheap, Ugly Stoppers? This Wine Bottle Stopper Set Is What You've Been Waiting For!" Want to seal your wine or bottles perfectly? Have knack for quality and a respect for art? With this bottle stopper set, you'll have a perfect seal on your bottle and create a unique, decorative look instantly! Whether you're fed up with cheap stoppers that don't work or are buying these as a gift ...our stoppers are made for you. You'll wish you would have discovered these years ago. 2 sizes give you the perfect seal on different sized bottles. Feel guilt-free about this purchase, they're worth it. If you've tried other products (even other wine stoppers) but weren't happy...you NEED to give ours a try! PLEASE READ THIS BEFORE BUYING WINE BOTTLE STOPPERS ONLINE OR IN A STORE... Wine stoppers are NOT all the same. Don't buy it just because the price is lower! Cheap stoppers don't work nearly as well or look as beautiful and classy as ours. You get what you pay for and ours is guaranteed for a reason. Simply Click "Add to Cart" to seal your wine or bottles with the most elegant, best performing, and unique stoppers you'll find anywhere...100% Risk Free! From the manufacturer: Our wine preserving stoppers can run out of stock. This is because of a recent media story we were featured in. If you see the green "In Stock" above, place your order to claim yours before they're sold out again. ✎SEAL THE TASTE IN - No more wasted wine, champagne, whiskey, beer, soda, vinegar, oil or carbonated beverages. 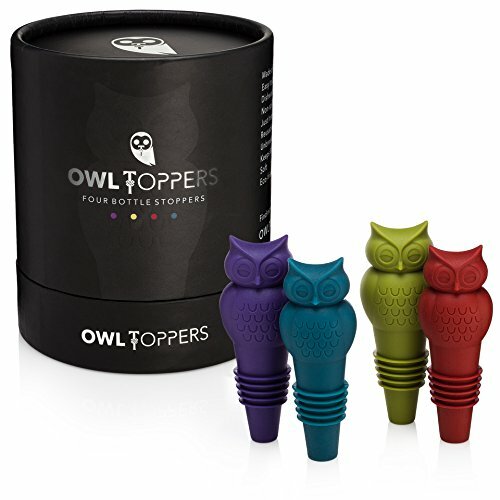 Simply slide your Owltoppers bottle stopper into any standard glass bottle opening so you can continue enjoying the full flavor and aroma next time. ✎PERFECT AIRTIGHT SEAL - 2 Stopper sizes are included for a completely air tight seal on almost any glass bottle. Listen for the "pop" when you remove the Owltopper and rest assured that no leaks will occur even when laying bottles on their side. Perfect for corking Champagne due to their superior sealing ability. ✎FOOD SAFE SILICONE - This adorable 4 pack of decorative wine stoppers is made from BPA free, food safe silicone. Easy to clean saving you time and effort. Precision moulded owl figure provides an easy to grip handle when inserting or removing the wine preserver. Four stunning colors include crimson red, decadent purple, peacock blue, and olive green. ✎MONEY BACK GUARANTEE - If you're not 100% happy with your set of four premium quality reusable bottle corks, simply return them for a no questions asked full refund. No risk, no fuss! If you have any questions about this product by Owltopper, contact us by completing and submitting the form below. If you are looking for a specif part number, please include it with your message.